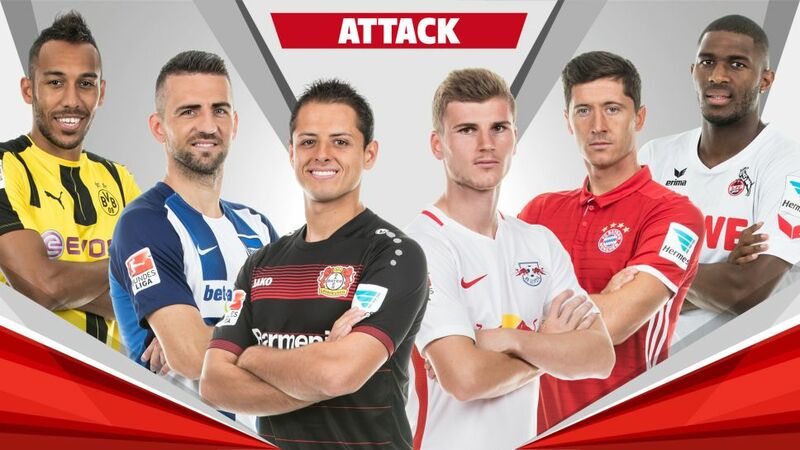 Which two out of these six attackers belong to the best in the Bundesliga so far this season? It's time to choose your 2016/17 Bundesliga Team of the Hinrunde, so pick two attackers from the six below! Köln fans would probably rather not contemplate what life would be like without Modeste, who has netted 13 of their 21 goals (62 percent) so far this season, leaving him in second place in the scoring charts. That has taken him already to within two of his total tally from last season, which was a personal record and made him the most prolific Frenchman in a single Bundesliga campaign. With a goal, on average, every 153 minutes, he has a better ratio than Bundesliga greats Karl-Heinz Rummenigge or Jürgen Klinsmann. Scoring against RB Leipzig on Matchday 16 completed the collection for Lewandowski, who has now found the net against every current club in the Bundesliga. That took him to 12 for the season and third in the scoring charts, although given the number of shots he has had (63), he could arguably have had more to his name. That said, he is working his way up the Bundesliga's list of all-time leading foreign goalscorers and is now joint-second with Giovane Elber (133 goals). SV Werder Bremen's Claudio Pizarro is the only non-German player who boasts more Bundesliga goals (190). Aubameyang is the leading scorer in the Bundesliga so far this season with a sensational 16 goals (none of his teammates have managed more than four). The Gabon star has averaged a goal every fourth shot on goal and put four past Hamburger SV alone on Matchday 10, while nine of his 16 strikes have come on the road. A first Torjägerkanone is firmly within his reach. Leverkusen's top-scorer with five goals this season, Chicharito has some work to do to match the 17 he scored last season and maybe a petition to make the size of the goal just a centimetre bigger would help: he has been denied three times by the woodwork this season. Nevertheless, he has a record of a goal every 148 minutes and is the most prolific Mexican in the Bundesliga by a long way. Ibisevic is one of a select group of players to have scored 100 Bundesliga goals, and he reached that landmark figure this season in his 240th German top-flight appearance. The Hertha captain has eight goals to his name in 2016/17, including three braces, and all of those have come from just 38 shots on goal. If that was not enough, he has also set up three goals for teammates this term. With nine goals, Werner is Leipzig's most successful Bundesliga marksman, and he has already scored more for his new club in Germany's top flight than he did for VfB Stuttgart (six) in a single season. With a further two assists, he has also had more of an influence in the first half of the current campaign than he ever had in a full season for the Swabians. He also became the youngest player ever to reach 100 Bundesliga appearances, doing so on Matchday 5.